2 of my coworkers drink nothing but Dunkin Donuts each morning. One for the coffee, one for the tea. They refuse to go anywhere else. It's uncanny. I'm going to suggest they check out this new app that DD just launched. People can now run on Dunkin’ more quickly and conveniently than ever before, as Dunkin’ Donuts, America’s all-day, everyday stop for coffee and baked goods, launched its first-ever mobile application for payment and gifting for iPhone, iPod touch and Android smartphones. With the new Dunkin’ App, paying for food, beverages, and merchandise at Dunkin’ Donuts restaurants throughout the U.S. is as simple and speedy as scanning your smartphone using a mobile Dunkin' Donuts Card in-store or at the drive-thru. Additionally, with the App’s mGift feature, Dunkin’ Donuts becomes the first national coffee retailer to enable people to send virtual gift cards three ways – text, email, and Facebook Connect. • Purchase, manage, and reload a Dunkin’ Donuts Card: Guests can purchase a new mobile Dunkin’ Donuts Card (selecting from multiple designs for many occasions), add money to an existing card, and view all previous card transactions. The Dunkin’ Mobile App supports American Express, Visa, MasterCard, Discover, and PayPal. • Pay right from the app using a virtual Dunkin’ Donuts Card: Guests can purchase Dunkin’ Donuts products with the Dunkin’ App by simply tapping the mobile Dunkin’ Donuts Card and presenting the screen to the crew member to be scanned. Balances are updated immediately after purchase. 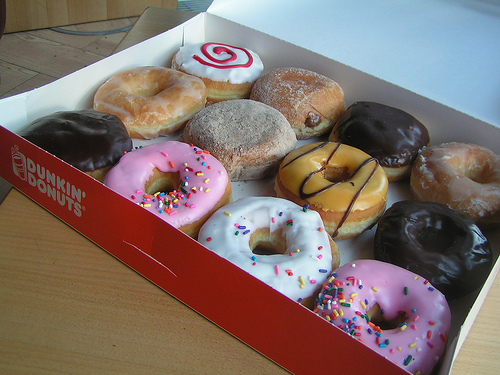 • Send an mGift: Dunkin’ Donuts Cards can be sent to friends, family, or colleagues via email, text, or Facebook. Dunkin’ Donuts is now the only national coffee retailer to offer people all of these options for sending an mGift. Dunkin’ Donuts Cards can be sent in denominations between $2 and $100. • Locate the nearest Dunkin’ Donuts: A detailed restaurant locator makes it easy to find directions to and information about local Dunkin’ Donuts restaurants, including store hours, in-store Wi-Fi, drive-thru availability, and more. • Find nutritional information: The Dunkin’ App makes nutritional facts available for guests’ favorite Dunkin’ Donuts menu items. 1 Response to "Dunkin Donuts has an App Now"
Too bad the "DD Perks Rewards" doesn't have any actual rewards. At least the Starbucks pay with your phone gives you a free drink after buying a certain amount.